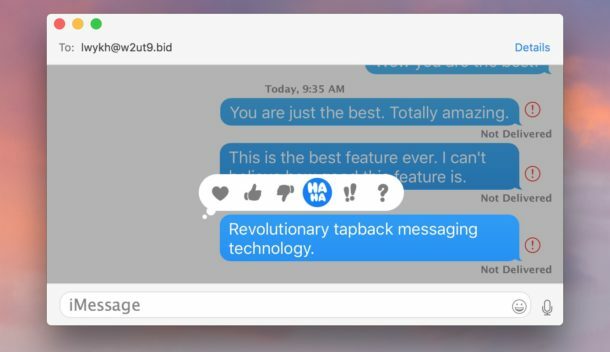 Tapback messages offer an in-line visual icon response to any message, it’s a fun feature on iOS Messages app that is also one of the few message effect features available on the Mac. The currently available tapback message responses are a Heart, a Thumbs Up, a Thumbs Down, a “Ha Ha”, “! !”, and “?”. You can use one tapback message response per message at a time, but you can also change them by choosing a different tapback icon. The tapback icons on Mac are the same as those available on iOS, and one sent from a Mac will be visible on iPhone and vice versa. The tapback message feature on Mac is very similar to iOS but initiating it is with a click rather than a tap and hold. You’ll need a modern release of Mac OS system software to have this feature, 10.12 or later is sufficient. The tapback message will be inserted in-line atop the message you assigned it to, complete with a little bubble indicator. This feature is fairly simple but it can be fun and offer a quick way to respond to a message without having to type out a response, and it can be particularly relevant if something is deserving of a simple indicator of your feelings towards it (assuming those feelings are satisfactorily displayed by a little icon anyway). 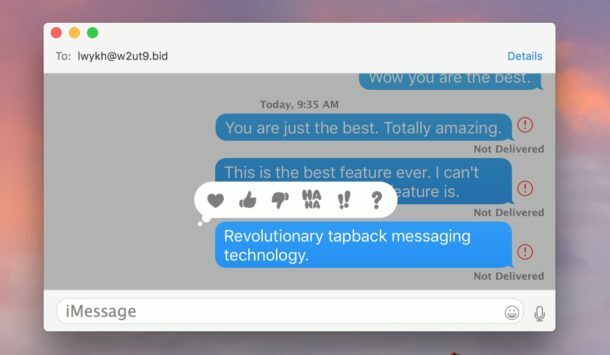 You can also remove a tapback response from a message by clicking and holding and then selecting the highlighted and previously chosen tapback icon. 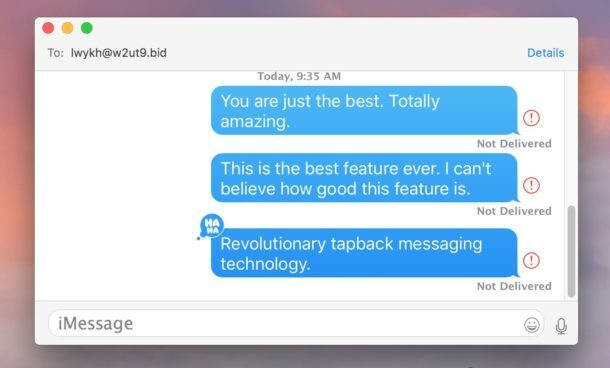 Tapback messages are fun, and perhaps in the future the Mac Messaging app will get more of the iOS messaging features, like stickers, screen effects, and GIF search. Until then, you’ll have to use a lot of copy and paste, or your imagination. I’m on High Sierra and can’t seem to add a tapback if someone else has already tapped back on the same message (photo in this case). I was able to do so on IOS (latest version). I can tapback on an “empty” message on Mac OS as well. I just can’t do it on Mac OS subsequent to any other tapbacks. I truly hate this feature. And the fact that I can’t opt out is the worst part. I’ve been googling for years “how to disable tapbacks in osx” with no solution. However, i have found a lot of other people expressing anger at the feature. Why can’t we opt out yet?